DiFeliceantonio’s team made the discovery by giving rats an artificial boost with a drug delivered straight to a brain region called the neostriatum. Those animals gorged themselves on more than twice the number of M&M chocolates than they would otherwise have eaten. 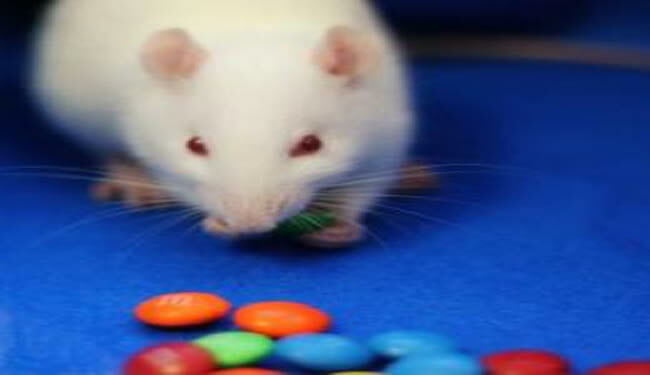 The researchers also found that enkephalin, the natural drug-like chemical produced in that same brain region, surged when rats began to eat the candy-coated morsels, too. DiFeliceantonio’s team made the discovery by giving rats an artificial boost with a drug delivered straight to a brain region called the neostriatum. Those animals gorged themselves on more than twice the number of M&M chocolates than they would otherwise have eaten. Image info in notes below. It’s not that enkephalins or similar drugs make the rats like the chocolates more, the researchers say, but rather that the brain chemicals increase their desire and impulse to eat them. The findings reveal a surprising extension of the neostriatum’s role, as DiFeliceantonio notes that the brain region had primarily been linked to movement. And there is reason to expect that the findings in rats can tell us a lot about our own binge-eating tendencies. September 23, 2012 Antonio Casals M.
September 22, 2012 Athena Staik, Ph.D.